Definition and Summary: The Oregon Treaty of 1846, also known as the Washington Treaty, was signed between Great Britain and the United States on June 15, 1846, in Washington, D.C. The Oregon Treaty of 1846 finally settled the land dispute between the two nations who had agreed at the Convention of 1818 to a "joint occupation" of Oregon territory. 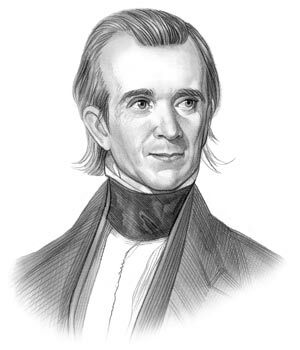 James Polk was the 11th American President who served in office from March 4, 1845 to March 4, 1849. One of the important events during his presidency was the Oregon Treaty of 1846. The Oregon lands were referred to by the British as the Columbia District, which was a fur-trading division of the Hudson's Bay Company The Americans referred to the lands as the Oregon Country. The United States claim to the Oregon lands were based on the Lewis and Clark Expedition and the establishment of the Pacific Fur Company trading posts set up by John Jacob Astor. Great Britain based its claim on the Oregon lands on the James Cook exploration of the Columbia River. The Oregon lands were therefore claimed by the British and Americans and covered the land north of California and west of the Rocky Mountains. Oregon was a massive region of land and included not merely the present state of Oregon, but all the territory west of the Rocky Mountains encompassing the area including present-day Oregon, Washington, and most of British Columbia. In the Convention of 1818 Britain and America agreed to a "joint occupation" of Oregon in which citizens of both countries could settle. The 1818 agreement lasted until 1846 when the Oregon Treaty with Britain was established resolving the dispute over possession of the lands extending from the Rocky Mountains to the Pacific Ocean from the Lake of the Woods to the Rocky Mountains. In 1819 the Transcontinental Treaty set the southern boundary of Oregon Country as Spain ceded its claims to the territory to the United States. The 1842 Webster-Ashburton Treaty had resolved border disputes concerning the Maine / New Brunswick boundary partially delineating the northeastern U.S - Canada border which led to the bloodless, International incident known as the Aroostook War. However the Webster-Ashburton Treaty had left the border of the Oregon Territory unsettled. The area of the Oregon Country was again hotly disputed by the United States in 1844. This was he time in American history when there was a strong belief in the Manifest Destiny of the United States and an overwhelming determination to encourage Westward Expansion together with expansion into the Mexican Southwest and California. The nation believed it had the right to extend its rule across the North American continent and American citizens adopted the popular cries of "All of Oregon or none!" and "Fifty-four forty or Fight!". The United States gave notice of the ending of the joint occupation and asserted their claim to the entire Oregon Country up to Russian America at parallel 54°40′ north. The British government insisted that the western end of the line should follow the channel between Vancouver's Island and the mainland making the island entirely British. The United States were in a difficult position. The Mexican War was looming and the federal government realized it would be extremely foolish to fight two wars at one time and the 'near miss' of the Aroostook incident had made the politicians cautious with its dealings with Great Britain. The US therefore agreed to terms demanded by the British and accepted a compromise along the 49th parallel as far as the Strait of Georgia. Instead of Instead of "All Oregon" the United States received about one half of the lands, which was still a massive area. The info about the Oregon Treaty of 1846 provides interesting facts and important information about this important event that occured during the presidency of the 11th President of the United States of America. The Oregon Treaty took place in Washington on June 15, 1846. The negotiators of the treaty were James Buchanan, who was the Secretary of State for the United States and the British minister in Washington, Richard Pakenham on behalf of Great Britain in which they agreed to draw the western Canadian-American border along the 49th parallel and opened the floodgate to the westward migration of many pioneers and settlers along the Oregon Trail. The Oregon Territory was established in 1848 and eventually became 33rd state in 1859. What were the Provisions of the Oregon Treaty? ● Agreed that the property rights of the "Hudson's Bay Company" and its subsidiary the "Puget's Sound Agricultural Company"
The article on the Oregon Treaty of 1846 provides an overview of one of the Important issues of his presidential term in office. The following James K Polk video will give you additional important facts and dates about the political events experienced by the 11th American President whose presidency spanned from March 4, 1845 to March 4, 1849.